I try to follow a marathon training schedule. Mostly because it seems fashionable. The thing to do when you are training for a marathon. Maybe at this age I’m finally trainable? And, now that I have a training schedule, perhaps I should read it? The important stuff. The part that described the distance for this weeks long run. The part that said 16. Not 19. Yet, in my mind – the magic number was 19. That’s what I imagined was on my fashionable schedule. I was mentally ready for 19 miles. 19 is really not that far. That’s what I told myself. Easy peazy and full of confidence. My morning started in the usual way. 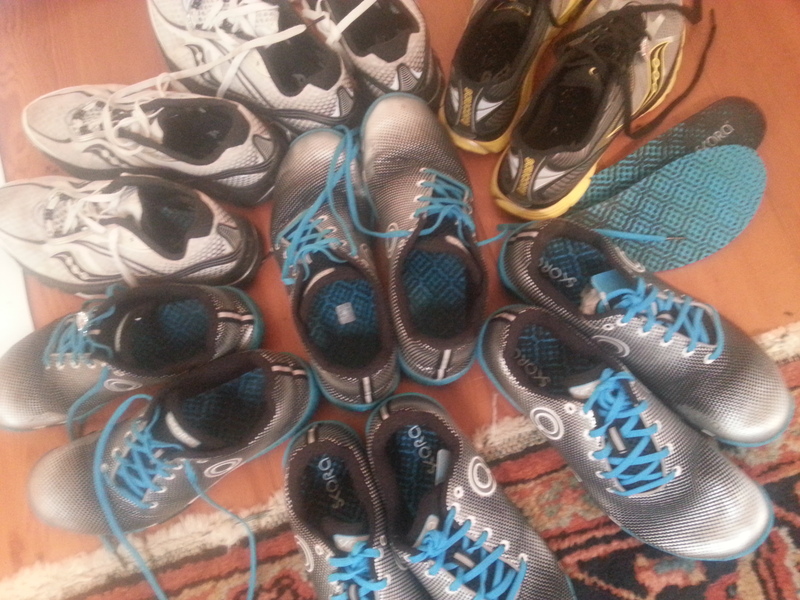 Choosing which pair of running shoes from the rotation. The selection process is simple. Right now, I’m running in Skora’s – and I choose my tools based on the soggy factor. If it is still soggy from a prior day run – I leave it alone. If it is dry – it becomes the shoe de’ jour. I inhaled breakfast – a smoothie – which consisted of a little bit of everything in my kitchen: spinach, strawberries, blueberries, 1/2 banana, a tablespoon of all of these — protein powder, oatmeal, flax seeds, peanut butter, glucosamine, omega 3 – and a dash of cacao nibs! Yum! By 7AM, I’m off. Solo. My goal would be to get 14 miles done before rendezvous with my biker-hubby – and we would do the last 5 miles together. The last 5 miles would be the most challenging part of the route. Hills. I needed to mimic miles 13-16 in NY. Climbing the Queensboro Bridge. It didn’t take long to notice that humidity would be a factor today. The humidity was much higher – than on any of my prior long runs. By mile 2, I’m drenched, and had consumed half of my water. My route today will certainly hover around places where I can re-hydrate (i.e. the Safeway!). The interesting thing about humidity, is that it creeps up on you. You think you are doing fine – and suddenly, you are losing speed at a rate of 20 seconds per mile. By mile 10 – it was time to hit the Safeway water coolers, and the freezer aisle. Aaaaah. The air conditioning was bliss. Returning back to my run, and despite feeling slower and slower, my mind remained optimistic. I spent the rest of my run listening to my “mind”. At mile 12 – my Garmin apparently had enough of the humidity and quit. No worries. I had backup this week, and quickly turned on GPS watch #2. I re-united with biker-hubby at mile 14. He’s got the routine down. I don’t have to ask him to bring things. He knows. Water, lots of ice, banana, a wet towel and packets of honey. After a minute or 2 – we are off for the final 5 miles. We traversed the hilly portion of my course, with the humidity and sunlight morphing me into something that resembled super slow motion. But it didn’t matter. I finished – all 19 miles. Done. And then discovered that my training schedule only required me to run 16 miles…not 19. I guess I should read the schedule next time. awesome! you are sooooooo ready!